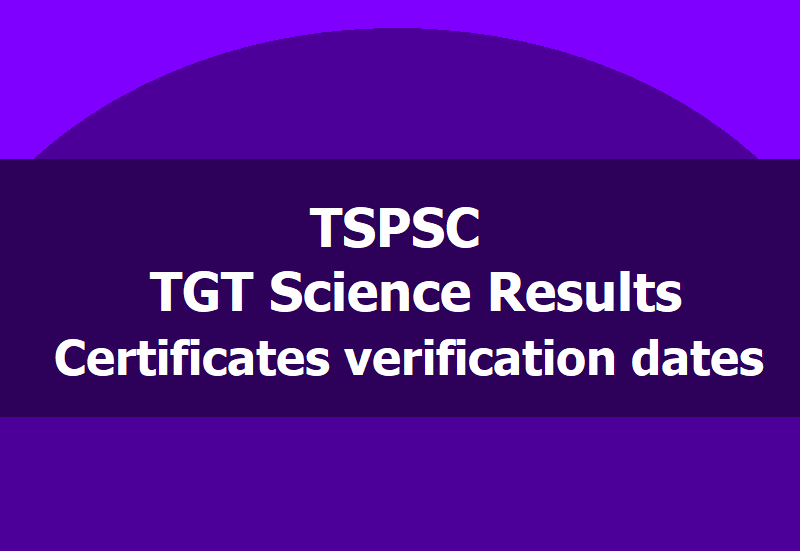 TSPSC TGT Science Results, Certificates verification dates 2019 (5th spell): TGT Science Results for Certificates verification(5th spell): TSPSC has informed that, In compliance with the Hon’ble High Court orders in W.P. No.20232/2018 dated 06/09/2018 and as per the relinquishment given by the selected candidates in Selection Notification for the post of TGT Science, Dt: 07/06/2018 , a revised Selection has been done and 56 candidates with the following Hall Ticket Numbers are provisionally picked up for Certificate Verification for the post of TGT (Science) subject in various Residential Educational Institutions Societies for 1:2 ratio (5th spell). The Certificate Verification is scheduled to be held on 03/01/2019 at TSPSC Office, Prathiba Bhavan, Nampally, Hyderabad from 10:30 AM to 1:00 PM. The Candidates have to bring the following certificates in original along with one set of Photostat copies duly attested by Gazetted Officer without fail. Note: The candidates who are provisionally selected for any other post are requested to relinquish their claim for TGT Science if they desire to, so that the Commission can select any other candidate according to Rules as per 6-A of TSPSC Rules of Procedure. candidates have to under go a medical examination at respective Medical Board. Applicants must possess the qualifications from a recognized University/ Institution as detailed below or equivalent thereto, as specified in the relevant Bye Laws/ Service Regulations, indented by the Residential Educational Institutions Societies as on the Date of Notification. iii) Graduation with Language concerned as one of the Optional subjects (OR) Bachelor of Oriental Language (or its equivalent) (OR) Graduation in Literature (OR) Post Graduation in Language concerned from a University recognized by the UGC with at least 50% AND Language Pandit Training Certificate / B.Ed. with Language concerned as one of the Methodologies from any Institution recognized by NCTE, in respect of Language Teachers. (In case of SC / ST /BC / Differently abled candidates, the minimum marks shall be 45%) AND Pass in Paper II of Telangana State Eligibility Test (TSTET) / Andhra Pradesh Teacher Eligibility Test (APTET)/Central Teacher Eligibility Test (CTET) Note: 20% of weightage will be given to TET Paper-II score and 80% weightage to the written test conducted by TSPSC. In case of APTET, scores obtained before the appointed day i.e, 02-06- 2014 shall only be considered. 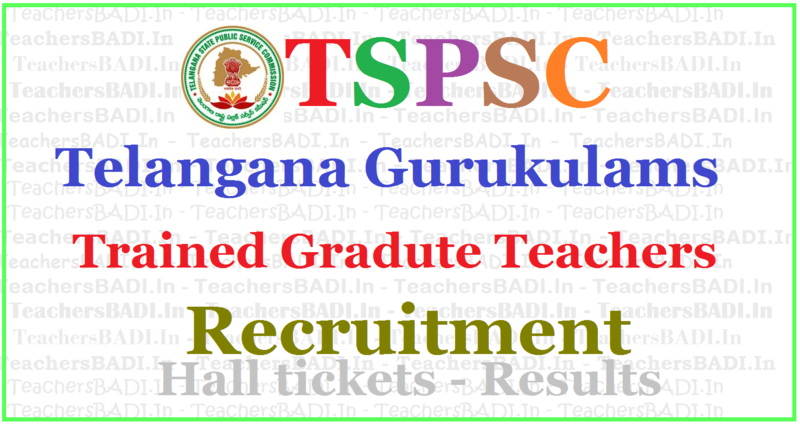 2 Trained Graduate Teachers in Telangana Social Welfare Residential Educational Institutions Society. 4 Trained Graduate Teachers in Mahatama Jothiba Phule Telangana Backward Classes Welfare Residential Educational Institutions Societies. NOTE: Subject wise vacancy position is available at ANNEXURE-I and candidates may apply as per the vacancy position in their concerned subject. Minimum 18 years & Maximum 44* years. The age is reckoned as on 01/07/2017 (Rule- 12(1)(a)(v) of State and Subordinate Service Rules). *As per G.O. Ms. No. 329, GA(Ser.A) Dept., Dt. 27/07/2015 read with G.O. Ms. No. 264, GA(Ser.A) Dept.,Dated: 26-07-2016, the upper age limit is raised up to 10 years. (Employees of TSRTC, Corporations, Municipalities etc. are not eligible). 5 Years based on the length of regular service. 1. The applicants will be subjected to a “Preliminary (Screening Test)” of Objective Type for the purpose of short listing the number of candidates to be admitted to the main examination (Objective Type) and the marks secured by the candidates in the preliminary (Screening Test) will not be counted for the purpose of final selection in terms of G.O.Ms.229, GA(Ser.A) Dept., dated 30-06-2016 read with G.O.Ms.No.316, GA (Ser.A) Dept., dated 17-08-2016. 2. The candidates will be picked up for the main examination based on their performance in preliminary examinations in the ratio of 1:15 in their respective categories duly following the Rule of reservation. 3. Those candidates who qualify in the Main Examination (Objective Type) in order of merit by giving 80% weightage for written test and 20% weightage marks in TET Part-II put together will be called for in 1:2 ratio for verification of Certificates, Community and Category wise for the vacancies available. The minimum qualifying marks for Selection are OCs 40%, BCs 35% SCs, STs and PHs 30%. The minimum qualifying marks are relaxable in the case of SC/ST/BC/PH at the discretion of the Commission. The selection to the post will be based on marks secured in the main examination. 4. The candidates will be selected and allotted to the Residential Educational Institutions Societies in Telangana State as per their rank in the merit list and as per zonal preference for allotment of candidates against vacancies and for the vacancies available. 5. The appearance in all papers at the Written Examination as per rules is compulsory. Absence will automatically render his candidature as disqualified. 6. Candidates have to produce Original documents and other particulars on the day of verification itself. If candidate fails to produce any of the required certificates and if the particulars furnished by him / her in the Application do not tally with the Original documents produced him / her, then his / her candidature will be rejected/disqualified without any further correspondence. As candidature for the recruitment is processed through Computer/Electronic devices based on the particulars furnished in the Application Form, the candidate is advised to fill in all the relevant particulars carefully. 7. While the Commission calls for preference of candidates in respect of posts/R.E.I. Societies etc., in the application form, it is hereby clarified that the said preferences are only indicative for being considered to the extent possible but not binding or limiting the Commission’s powers enjoyed under Article 315 and 320 of the Constitution of India. Therefore, the Commission has the power to assigning a successful candidate to any of the notified posts for which he is considered by them to be qualified and eligible, subject to fulfilling the selection criterion. 8. The appointment of selected candidates will be subject to their being found medically fit in the appropriate Medical Examination, and if he/she is of sound health, active habits free from any bodily defect or infirmity. iv. The question paper of Preliminary (Screening Test) and Main examination will be supplied in English version only except languages. How to download the hall ticket..
* In the section, click on "Hall ticket Download for ..............."
* Download the Hall ticket take the print for entry to exam hall and preserve the future reference. what abt B.Com candidates .. is it B.com student are eligible for TGT? TELUGU MEDIUM CANDIDATES ARE ELIGIBLE?